Mireyah & David are two of my favorite people. I'm not exaggerating. Really. Two of my favorites. They are so different, but yet they fit together so perfectly. Dave is hilarious, to say the least. So dryly funny. I mean, laugh-until-you-start-choking funny. Besides Neph, Dave probably cracks me up more than any other person on the planet. He cracks all of us up. But Mireyah, most of all. He talks, she laughs. It works out pretty well. And that's how it goes with most things. Where Dave is tough, Mireyah is gentle. Where she is kind, he is strong. Where he is logical, she is full of feeling. And she is generous. So ridiculously generous with her time and with with her attention. When you are in conversation with her, it is as if nothing else is more important or pressing to her than what you are saying at that moment. To say you have her full attention is such an understatement. She is engaged, never rushing. Where David's waters are quick and flowing, Mireyah's are still and deep. They are so different, but so wonderful together. 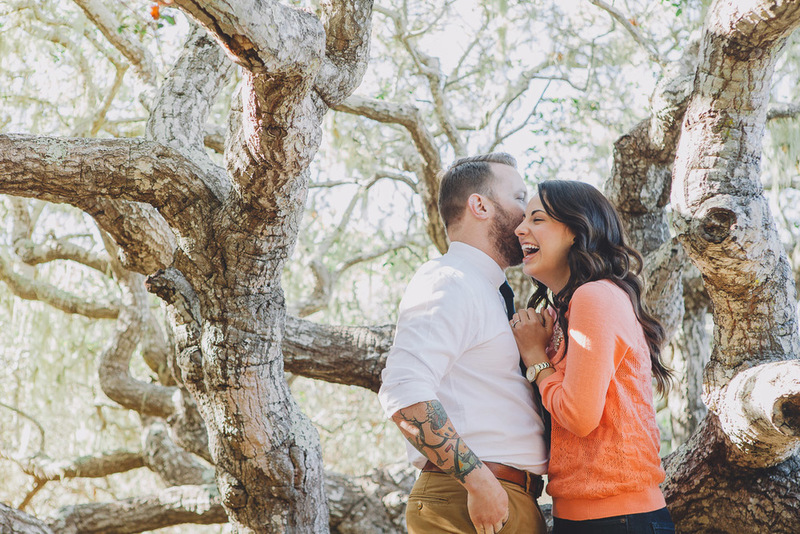 Which means, when it came to their engagement shoot, it had to be something special. These are some of my best friends, people. This deserves a... road trip! :)) So we grabbed some friends and headed up the coast to Los Osos (think San Luis Obispo). We left on Friday, driving well into the night, and awoke Saturday morning ready for adventure. In other words, we had no idea where we were going or what we were going to do. We had heard about this crazy forest and thought that might be a good place to start, so we asked around till we got some (kinda sketchy) directions. Who knows if we actually ended up in the place we were looking for, but then it didn't matter. We found a spot just as cool. Photographs ensued. Endless photographs, because each of our friends is a pretty sick little Instagramer in his/her own right. The six of us together probably made for hundreds of shots. I'm not joking. We didn't stop there, though. We had come to Los Osos for forest or shore, and HILLS. 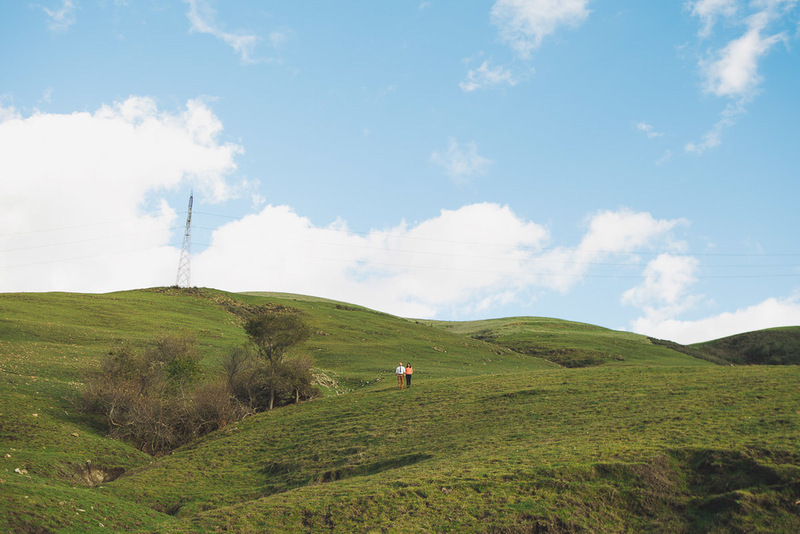 We were determined to shoot somewhere amongst the boundless rolling hills throughout the area. They were so green, and so breath-taking. So we drove for what felt like hours, racing the sun, in search of a place to shoot. A place, that is, without a barbed wire fence and a NO TRESPASSING sign. It seemed every single hill was reserved for grazing. So finally, we did what anyone would do. We found a dirt road with a few mailboxes out front and decided to take our chances. I'm not sure any of us were too confident of this plan, but what can I say? Group think, people. The sum was braver than the parts (at least my part, that is). Until a farmer rolled up behind us in his old pick-up and (somewhat) nicely asked us what we thought we were doing. We told him our wonderful friends were wonderfully engaged and we were trying to take some quick but wonderful photos of them. Or something like that. His response: "There's a few of us farmers along this road. You can use my part of it, but watch how far along you go. Not sure anyone's home up the road right now......... Just be careful of the dogs." Dogs? I love dogs! No problem. "They aren't fenced in... and, uh... well, you don't want to run into them. " We all looked at each other, hesitated, but then breathed a collective "Screw it. Let's do this." At least that was the gist of it. And I'm so glad we did. It was such a beautiful setting, not just for the photos but for all of us to witness. It was a spectacular sunset. I stood there, watching the sun go down, so overwhelmed by the beauty and the immensity of Jesus' creation. At the risk of sounding cheesy, it was a very special moment. Granted, a special moment during which I had to wear gloves because my fingers were about to fall off from the cold. Nonetheless, it was a such blessing to be there and a blessing to get to shoot our beautiful, head-over-heels friends...... and an even bigger blessing that we all made it into the car, literally sped off, door still ajar, just as the dogs made their way over the hill toward us. Phew.